Are you looking for a really good present for your nan? Our Gift Gofers have hunted down a selection of gifts at various prices that we're sure she would love to receive. How can we be so sure? Because our gifts were personally selected by an actual grandmother! The British Pullman conjures up images of a more glamorous age. Revel in luxury and nostalgia and board a carriage dating from the 1920s or 1930s, staffed by liveried stewards. The journey begins in style, with Bellini and brunch on board while gliding through the English countryside en route to one of a number of historic destinations. Choose from some of Britain\'s finest towns and cities or attractions such as Bath, York, Chatsworth House, Cambridge and Ely, Longleat, Sandringham, Blenheim Palace and The Cotswolds. On arrival, disembark for a guided coach tour, walking tour or entry to your local attraction of choice. On the way back, relax and enjoy a glass of champagne and a freshly prepared meal with wine. The year is 1933. Love and intrigue are in the air - board the Belmond British Pullman and meet some suspicious characters embroiled in romance and murder. Revel in the glamour of the original Pullman carriages from the 1920s and 1930s, with exquisite art deco marquetry, polished brass and first class service from the unique British Pullman liveried stewards. Relax in a comfortable armchair on a journey routed via Kent from London Victoria, with a glass of chilled champagne, ready to sift through the evidence. Then a delicious, freshly prepared five-course meal is served with a half bottle of wine and guests attempt to solve the crime and unmask the dastardly murderer. 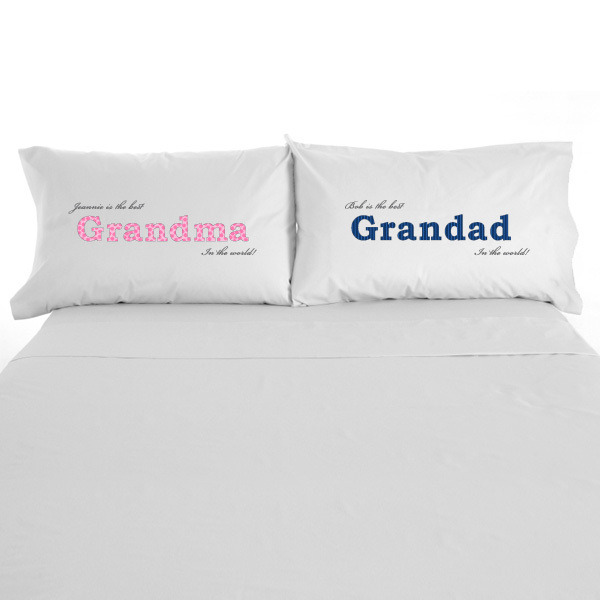 The perfect gift for Granny and Grandpa, these pillowcases are personalised with their own name and their preferred title. Show the Grandparents just how much they mean to their adorable Grandchildren with this fantastic personalised cushion which is printed with their names and a special loving message. This Personalised Best Grandparents Glass Keepsake is a wonderful Personalised Gift for special Grandparents in your life. Give them this beautiful gift to show her how special they are to you. This Shiny Silver picture frame makes the perfect present for the Grandparents no matter what the occasion whether it's an anniversary, birthday or retirement gift. 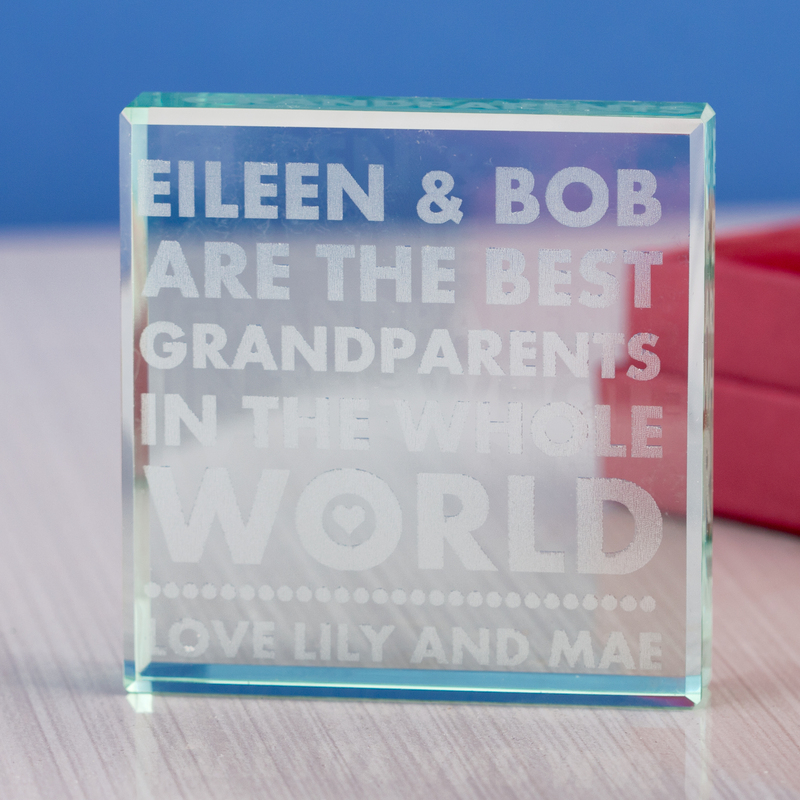 The shiny silver photo frame is engraved at the top with the word Grandparents. Underneath the photograph we engrave your personal message over 2 lines with up to 25 characters on each line to create a unique and personal gift idea. The frame holds a landscape image and can be stood on any flat surface thanks to its easel stand on the reverse. The frame holds a 6 by 4 inch photograph and makes a lovely gift for the Grandparents. 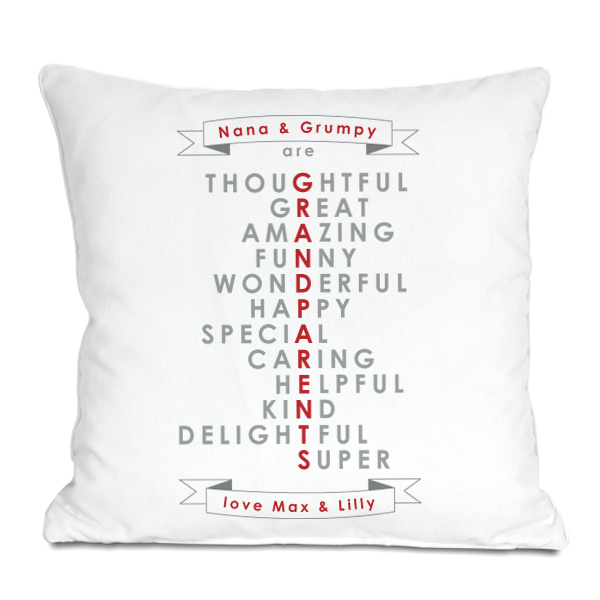 The grandparents can be pretty hard to find gifts for, but at the Personalised Gift Shop we offer a variety of ideal gifts with these fantastic Grandparents pillowcases being one of our personal favourites. The Pillowcases can be purchased as a pair or as singles and are personalised with the grandparents "name" and their "title." If my personalisation was "Grandpa, Jim" then the pillowcase would read: Jim is the best Grandpa in the world With the word Grandpa appearing in a striped blue text for a male or flowery pink text for a female. Size: 75cm x 48cm (Approx) Made from 100% Polyester. A lovely gift for a new grandparent, and a great way to pass on to children the history of their family. Each chapter asks questions that help to compile a family archive, with space to record ancestors, family traditions, stories and photographs. This customizable Nain and Taid - Welsh Grandparents' Lovers Mugs is designed on the lovers mug and would interest those who like wales, welsh, cymru, grandparents, nain, taid, and grandfather stuff. Great Gift Ideas for Granny! How can you be sure they will like the gifts we suggest? Our gifts have all been researched and carefully selected by an actual grandma, so you can be sure that the gift ideas we present will be things that a grandmother is likely to really appreciate. Of course, not all nans have exactly the same tastes, so we asked our Grandparent-Gofers to select a variety of gifts of different types and at various prices. The gift ideas on this page have been carefully chosen as suitable for a grandmother. gift ideas for Grandfathers and some more gift ideas for a pair of grandparents!